Apple is set to release a slew of new products during the third quarter of 2014 according to KGI securities analyst Ming Chi Kuo, who often provides reliable information on Apple’s product lineup. In a 2014 product roadmap, Kuo suggests Apple will introduce its first new product of the year, a lower-cost iMac, during the second quarter. Soon after, during the third quarter, Kuo predicts Apple will introduce an upgraded iPad Air and iPad mini, followed by an iWatch in two separate sizes, and a 4.7-inch iPhone. An upgraded Apple TV set-top box will come somewhat later, as will the rumored 12-inch ultra slim MacBook and upgraded Retina MacBook Pros. Later, in the fourth quarter, Apple will introduce the 5.5-inch iPhone, which is said to be delayed due to issues with in-cell display technology. 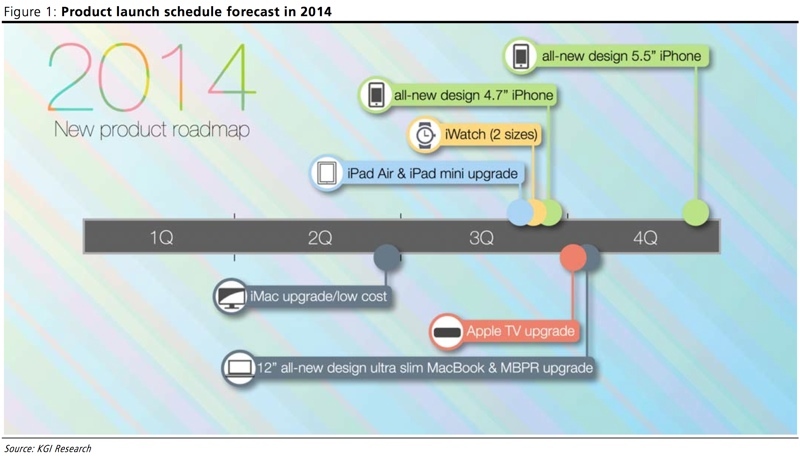 Along with his roadmap, Kuo also gives specific information on each of Apple’s upcoming products. - iWatch: Kuo believes the iWatch will ship during the end of the third quarter, offering biometric functionality, integration with the iPhone, iPad, and Mac, and a "fashionable appearance." As has been previously suggested, he predicts the device will come in two sizes, with a 1.3-inch and 1.5-inch flexible AMOLED display. It will also include a sapphire cover lens, biometric recognition, an NFC chip, wireless charging, a 200 to 250 mAh battery, and a slim and light design. Kuo also believes that Apple will offer the iWatch at multiple price points, with the most expensive version costing upwards of $1,000. - iPhone 6: Supporting previous iPhone 6 rumors, Kuo believes the device will come in two sizes: 4.7 and 5.5-inches, with resolutions of 1334x750 (326ppi) and 1920 x 1080 (401 ppi), respectively. Both models will come with an A8 processor, 1GB of RAM, LTPS display panels, optical image stabilization, and Touch ID. Kuo points to a 10 to 20 percent narrower bezel, a 6.5–7.0mm thickness, metal casings, and NFC integration. Mass shipments of the 4.7-inch version are expected in September, with the 5.5-inch version shipping later. Kuo suggests that only the 64GB 5.5-inch version will use sapphire displays. - iPad Air 2: The second-generation iPad Air is expected to adopt Touch ID, an A8 processor, and an improved camera with a resolution of eight megapixels. Kuo believes the second iPad Air could come earlier in the year than the previous iPad Air, which was released in October. - iPad mini with Retina Display: Like the iPad Air, a new Retina mini could gain an A8 processor and Touch ID, but Kuo believes it will retain the same form factor. He also suggests that the older iPad mini with Retina display could be sold at a lower cost. - 12.9-inch iPad Pro: Kuo believes that Apple is indeed working on a 12.9-inch iPad, but he does not expect it to be launched in 2014. - 12-inch MacBook Air: As rumored, Apple is believed to be preparing an ultrathin MacBook Air that incorporates a touchpad without buttons and functions without a fan. It is also expected to include a higher-resolution display. - iMac: A lower-priced iMac is believed to be on the horizon, which Kuo says could help boost iMac shipments by up to 23 percent. It could be Apple’s first product launch of the year. - Apple TV: Apple is not expected to launch a full television set this year, but an upgraded set top box with an App Store and motion control technology is expected. While Kuo’s predictions do include many rumors that have previously surfaced over the past several months from a variety of sources, his roadmap gives a solid overview of what we might expect from Apple in 2014. We've also broken out several of his predictions into individual posts that can be found here: iWatch, iPad, iPhone 6, MacBook Air. More analysts predictions based on rumour and speculation. everyone likes to bash on analysts. Kuo is often right. Certainly enough to pay attention to. My Mac mini, where art thou? Mac Freaking Mini. Damn you :apple:!